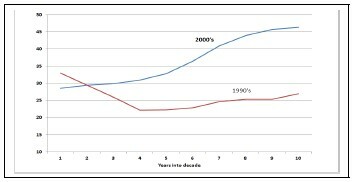 The Growth of the Cuban Economy in the First Decade of the XXI Century: Is it Sustainable? Real GDP in Cuba rose at an average annual rate of 5.3 percent during the period 2000–2010 (Table 1, line 1). This was well above the growth of GDP in the world as a whole (3.7 percent), in the advanced countries (1.8 percent), and in Latin America and the Caribbean (3.5 percent), although it fell short of growth in the developing and emerging market economies (6.2 percent).3 Real GDP growth in Cuba was quite variable during this period, partly because of sizeable year-to-year movements in the terms of trade. It was less strongly correlated with world output growth than was the case for major country groups—not surprisingly since Cuba is a relatively closed economy. Population growth during the decade was very small, and therefore real GDP per capita increased at approximately the same rate as absolute GDP. Growth in Cuba was also exceptionally high by historical standards. As illustrated in Figure 1, the level of real GDP during the first decade of the XXI century4 was always higher than in the corresponding year of the previous decade except for the first two years of each decade. Real GDP in the early 1990s had been severely affected by the end of Soviet assistance to Cuba, and it was only in 2005 that output exceeded its peak level of 1989. The evolution of growth from 2000 to 2010 features three distinct sub-periods: a moderate slowdown in 2000–02, a sharp acceleration in 2003–06, and a pronounced slowdown in 2007–10 (see Figure 2). As explained more fully below, these sub-periods were associated with large changes in government spending, investment, and exports of services to Venezuela. Growth in 2000–10 was concentrated in the services sectors. Output fell in agriculture and in the sugar sector, while industry and construction jointly accounted for only 15 percent of the total increase in GDP. Among the tertiary sectors, transportation and communications, commerce, hotels and restaurants, and financial intermediation together accounted for almost 30 percent of the rise in real GDP. Other services combined for a remarkable 55 percent of the total rise in output: culture & sports (8 percent), administration and defense (6 percent); education (9 percent); and public health (a whopping 38 percent). Real GDP in the public health sector increased at an unbelievable average annual rate of 21 percent from 2004 to 2010—unbelievable, that is, until you learn that it reflected the activities of Cuban doctors and medical personnel in Venezuela and a few other Latin American countries (more on this in the following sections). But there is more to the story. In 2005, the government announced that it would value social services at a much higher price than is customary in the United Nation’s system of national accounts. The most dramatic manifestation of this change was an 80 percent increase in real GDP in the health and social assistance sector in 2005! Nothing, not even the rise in the output produced by Cuban medical and teaching personnel in Venezuela, could possibly justify such a massive increase (see Figure 2). The average annual growth of employment in the period 2000–10 was 1.7 percent (line 3 of Table 1)—a relatively high number considering Cuba’s aging and stagnating population.5 It resulted from an increase in the participation rate, which in turn reflected a transfer of redundant employees (particularly in the sugar sector) to study programs, where they were counted as employed. In addition, the rate of unemployment declined from to 5.4 percent in 2000 to 2.5 percent in 2010. This is a remarkably low rate by international standards, but it is really not much to write home about since President Raúl Castro himself has suggested that there is a huge rate of hidden unemployment in the public sector. Nevertheless, the decline in unemployment is an indication of the rapid absorption of economic slack during the period. 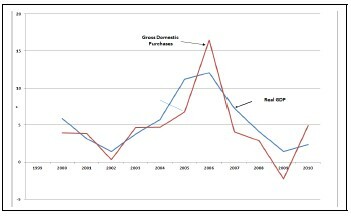 Real gross fixed capital formation averaged 11.6 percent of GDP in 2000–20l0 (line 7). This was low by the standards of other developing and transition economies but well above Cuba’s average in the 1990s. (Investment plunged in 1989–1994 following the end of Soviet assistance, although it recovered during the rest of the decade.) The fixed investment ratio declined in the first four years of the XXI century, but surged in 2004–08, resulting in rapid growth in the net capital stock (line 8). Moreover, the rate of utilization of capital is estimated to have increased substantially during the decade (line 9). The annual rate of increase in the official Consumer Price Index (CPI) averaged ½ of one percent in 2000–2010. Except for a spike in 2002, consumer price increases were low or negative throughout the period, significantly lower on average than in the emerging and developing countries and the Latin American and Caribbean groups in the IMF’s World Economic Outlook. Cuba’s inflation rate was surprisingly low, considering the rapid absorption in labor market slack during the period. As Oscar Espinosa Chepe (2000) has observed, the basket used in the official CPI includes only items sold in national currency markets, where many products remain subject to price controls. However, Vidal (2010) has pointed out that the CPI basket does include prices sold in informal and self-employment markets, with a combined weight of 30 percent. What is missing from the CPI basket, therefore, are items sold in convertible pesos (CUC) markets. Those prices are government controlled but they are occasionally raised by considerable amounts—Espinosa-Chepe mentions increases in diesel fuel and gasoline prices of 33 percent and 20 percent, respectively, in 2008. It should be noted that the deflators for GDP and household consumption increased somewhat faster than the CPI during the period, although movements in the three price variables were correlated (lines 10 through 12). The behavior of prices in the context of Cuba’s monetary policy is examined below. CAN CUBA’S RECENT GROWTH BE ACCOUNTED FOR? The collapse in investment and the steep deterioration of the terms of trade associated with the cessation of Soviet aid explains part of the massive contraction of Cuba’s real GDP in the period 1989– 1993. However, these factors account only for a small fraction of the subsequent recovery and expansion in 1994–99. Therefore, explanations for that period focused on the macroeconomic stabilization and structural reform measures adopted around 1993– 94, which were thought to have boosted total factor productivity, and therefore output growth.6 In particular, an extraordinarily strong fiscal adjustment brought down sharply the budget deficit and the level of state subsidies from the record levels recorded during the 1990–92 recession. Furthermore, various structural measures resulted in a significant rise in the participation of the private and cooperative sectors in the economy, and the de-criminalization of the use of the U.S. dollar helped to boost remittances from Cubans residing abroad. The situation in the first decade of the XXI century was quite different. First, as indicated in the previous section, the growth of employment and capital was fairly strong and is estimated to have made substantial contributions to the growth of GDP (Table 2). It should be noted that the estimated contribution of employment is probably overstated for two reasons: (i) students are now considered employees in the Cuban statistics rather than members of the inactive population; and (ii) an unknown but significant share of state employment has virtually zero productivity and is therefore inactive for all practical purposes. In addition to the brisk expansion of the capital stock, the rise in capacity utilization (a variable intended to capture the extent to which the capital stock is actually utilized), also made a substantial contribution to growth. Large terms of trade effects occurred from year to year, but they were relatively small for periods of 3–4 years. (The Annex explains how this variable was calculated.) For, example, there was a huge negative effect in 2008 due mostly to the collapse of world nickel prices and a rise in the price of oil, but this was partly offset by a sizeable terms of trade improvement in 2010 when both nickel and sugar prices rose. Residual growth (i.e., the growth of output that remains unexplained after taking into account the growth of inputs) remains large, which is not surprising in view of the mysteries of Cuban data and the limitations of the growth accounting framework. 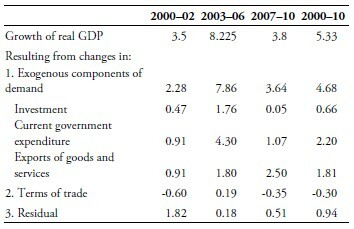 Much of the large positive residual shown for the period 2003–06 in Table 2 probably reflects the overstatement of output growth in the health sector that was referred to above. It is clear from the table that the sharp rise in current government spending during the middle years of the decade (which affected all major categories of expenditure) was the main source of growth in aggregate demand. It was followed by the growth of exports and investment. As explained more fully below, the rising contribution of exports reflected mostly increasing exports of services to Venezuela. In attempting to explain residual growth (i.e., that part of GDP growth not explained by input growth or terms of trade effects) we ask whether economic policies may have been at work. 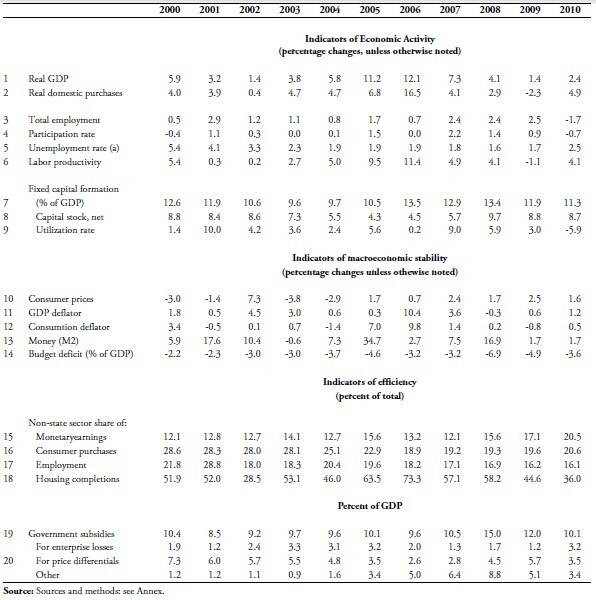 Beginning with macro- stabilization policies, the fiscal deficit of the central and local governments widened in relation to GDP from 2.2 in 2000 to 6.9 percent in 2008 before narrowing to 3.6 percent in 2010 (Line 14 of Table 1). The deficit averaged 3¾ percent of GDP for the decade as a whole, and never came close to the alarming levels recorded early in the previous decade. This is partly because much of the surge in state expenditure was accompanied by an increase in Venezuelan oil subsidies and payments for services provided by Cuban professionals. In sum, from the standpoint of macro-stabilization, fiscal policy was expansionary through 2008, and restrictive in 2009–10, i.e., since President Raúl Castro took control of economic policy. Government subsidies to enterprises (an indicator of both macro-stability and efficiency) rose in relation to GDP by 2 percentage points from 2000 to 2010. The government did a creditable job in keeping subsidies for enterprise losses under control, and subsidies associated with price differentials declined. However, a mysterious category of “other subsidies” surged, perhaps reflecting Venezuelan subsidies on Cuban oil imports. 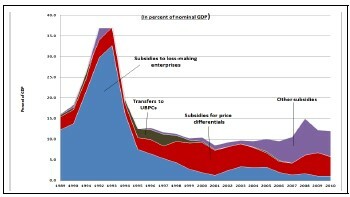 Figure 3 shows how the major types of subsidies evolved over the past two decades. Has monetary policy played a role in stabilization? There is no perceptible correlation between inflation and money growth in the short run (see table 1, lines 10 through 13). In the long-run, however, there is a correlation between currency and prices, and between M2 and prices.8 It is likely that monetary policy has restrained the growth of non-controlled prices so far in the XXI century. But inasmuch as 70 percent of the prices in the local currency sector are still controlled (and to the extent that they are not adjusted), changes in the money supply translate into changes in the monetary overhang rather than inflation, thus limiting, but not suppressing, the efficacy of monetary policy (see Hernández-Catá, 2011). The current account of the balance of payments remained under control through 2007, but it came under substantial pressure in 2008. The value of Cuba’s merchandise exports weakened owing to the slowdown in world economic activity, and actually fell in 2009 as national income dropped in Cuba’s major trading partners, including Venezuela and Western Europe. Receipts from tourism also fell in 2009, while interest payments on the country’s external debt surged. Against this background, and with import demand increasing rapidly, Cuba defended the exchange rate of the peso through intervention in the foreign exchange market, administrative restrictions on imports, foreign exchange rationing and, most dramatically, a freeze on CUC-denominated bank accounts held by foreign concerns. As Vidal (2010) convincingly argued, the central bank must have intervened heavily in both 2008 and 2009 to sterilize the effects of unusually large fiscal deficits on the money supply and maintain price stability. Whatever the short-run effects of that policy on domestic prices, it evidently helped to keep the exchange rate fixed. However, Vidal is right in that intervention is a costly way to maintain internal and external stability and that it would have been better to let the peso depreciate, thus changing relative prices and providing the incentives needed to improve the external balance. It is also important for the central bank to remember the heavy price paid by many countries that insisted on defending an overvalued exchange rate since the Mexican crisis of 1994, including Russia, Turkey Indonesia, Korea, and Argentina. Finally, while there is no doubt that a depreciation of the peso will help to improve the current account balance, the improvement will materialize only if domestic expenditure is reduced relative to domestic output. In that fundamental sense, the tightening of fiscal policy under the Raúl Castro administration was entirely appropriate, if not indispensable. The monetary earnings of the non-state sector (particularly its non-agricultural component) increased rapidly during 2000–2010, and the nonstate share of total monetary earnings surged from 12 percent of GDP in 1990 to over 20 percent in 2010. These earnings reflect only payments received from state organizations and exclude payments among entities in the non-state sector. Real household purchases from the non-state sector increased rapidly during the past decade, but less so than purchases from the state sector. The share of household consumption supplied markets in the non-state sector fell from 29 percent in 2000 to 21 percent in 2010. Most disappointingly, the share of the non-state sector in total employment fell during the decade from 22 percent to 16 percent. The proportion of agricultural land operated by the non-state sector increased from 64 percent in 2007 to 83 percent in 2011, in spite of a drop on the share of UBPCs—the Basic Units of Cooperative Production that were created in 2004 and have been struggling since then. Most of the increase came from private farms and the Cooperatives of Credit and Services (CCS). However, as pointed out by Nova González (2012), the conditions of land tenure remain fraught with uncertainties that discourage producers, and the prevalence of non-market prices squeezes farm profits and constitutes a major disincentive to producers. Finally, the private share of housing completions fell from 52 percent to 36 percent. This indicator is unreliable, however, because the series is extremely volatile. It is difficult to infer from these indicators that the relative importance of the private sector has increased or that this sector has contributed appreciably to output or productivity growth in the first decade of the XXI century. Has the economy become more open to foreign trade? The ratio of total trade (exports plus imports) to GDP did rise from about 23 percent in 1990 to 32 percent in 2010. However, almost 60 percent of that increase reflected transactions with Venezuela, much of it in oil—hardly a sign of improved competitiveness. Nevertheless, Cuban imports in general remain highly sensitive to changes in national income; Vidal (2008) has estimated the income elasticity of imports at 3. To sum up, it is hard to find evidence that structural measures helped to improve economic performance in the first decade of the XXI century. This was to be expected given the policy changes introduced in the middle of the decade that amounted to a wholesale backtracking from the market liberalization measures adopted in1993–94. These changes included the harassment and over-taxation of the small private services sector, the prohibition of several self-employment activities, and various measures that reduced sharply the autonomy of state enterprises, culminating in the obligation to deposit all hard currency earnings in a single account (cuenta única) at the Central Bank. Another harmful measure adopted in 2003–04 was the re-prohibition of the U.S. dollar, effectively ending the period of dollarization that had started in 1994. The old system was replaced by an abstruse multiple exchange rate system that introduced numerous distortions and discriminates against exportoriented enterprises while subsidizing import-intensive lines of production.11 The evolution of the exchange system is summarized in Table 4. But things have changed since then. Indeed, some of the recently-adopted or announced measures could have a significant effect on productivity. Second, sales and purchases of homes and cars by residents have been authorized. Third, implementation of a plan to fire as many as half a million employees from the public sector (roughly one tenth of the workforce) has started. ONE has recently reported that the number of self-employed rose from 147 thousand at the end of 2010 to 391 thousand at the end of 2011, while employment in agricultural cooperatives increased from 217 thousand to 652 thousand. As a result, the share of non-state employment rose during 2011 from 16 percent to almost 21 percent. A further substantial transfer of employees from the public to the private sector—provided the latter is ready to absorb them—would help to reduce disguised unemployment and greatly increase the average productivity of the national labor force. Fourth, a legal framework that would authorize access to bank credit by the self-employed, microenterprises, and private farmers was published in 2011 (Vidal, 2012, provides a full description). The framework also considers the possibility of (i) allowing households to access bank credit to purchase houses and cars; and (ii) authorizing the private sector to use bank deposits to effect payments. This could have implications for the conduct of monetary policy since the private sector so far has been restricted to the use of currency for payments, complicating its relations with state enterprises that operate almost exclusively with bank accounts. Fifth, sales of various consumer goods (including computers and DVDs) have been authorized. Finally, the permission given to Cuban citizens to visit hotels heretofore reserved for foreign tourists eliminates an unjust and unnecessary form of discrimination. As promising as they are, however, these measures are very recent, and they could not have influenced economic performance in the period under review in this paper. Moreover, these measures still have to be implemented in full. Even if they are, serious distortions would remain in many sectors of the economy, including controls on imports and foreign exchange, limitations on the legality and size of private firms and on the autonomy of state enterprises, interest rate controls, and an absurd multiple exchange rate system. Last but not least the system of price controls continues to distort resource allocation and interfere with the effectiveness of macroeconomic policies. A particularly sad example of the damage caused by this system is the exploitation of Cuban farmers through the imposition of high input prices and low sales prices by the bureaucratic empire of Acopio. In several periods of its independent history, Cuba has relied on various forms of assistance granted by foreign nations. For a long time in pre-revolutionary days, Cuba benefited from a preferential sugar quota granted by the United States. In the 1980s, Cuba received massive amounts of aid from the Soviet Union, mostly in the form of subsidies on oil imports and on nickel and sugar exports. Now Cuba receives subsidies on imports of Venezuelan oil and large payments for the services rendered in Venezuela (and other “friendly” Western Hemisphere countries like Bolivia and Nicaragua) by Cuban doctors, teachers, and military and security personnel. These payments have exceeded by a substantial margin the value of salaries that would have been paid under usual international practice (Castañeda, 2011). 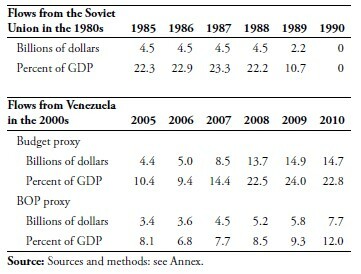 Table 5 shows two rough proxies for Venezuelan payments to Cuba. By way of comparison, it also shows Soviet assistance flows in the 1980s, which were very large until they suddenly vanished in 1990 because the Soviet Union disappeared and Russia could not afford, and did not wish, to continue carrying the burden. Precise information on Venezuelan aid to Cuba is not available from the countries involved, but the two indicators published by ONE and presented in Table 5 can help to gauge its magnitude. They suggest that recent inflows of Venezuelan aid may have been as large as the peak values of Soviet aid in 1986–88, i.e., more than 20 percent of the island’s GDP. Cuba’s dependence on Venezuelan payments is reflected in both the balance of payments and the fiscal accounts. A large part of the revenue from Venezuelan aid is offset in the budget accounts by matching expenditures on Cuban personnel operating abroad and subsidies on Cuban oil imports from Venezuela. However, based on published data, it is impossible to ascertain whether the remainder has been used to finance expenditure or to reduce the deficit. In the end, the effects on the fiscal deficit of discontinuing Venezuelan payments to Cuba probably would not be very large. Unfortunately, this cannot be said about the effect on economic activity. The estimated impact of ending Venezuelan payments (including the doctors/teachers program and the subsidization of oil imports) would be, using 2010 as a baseline, at least 16 percent of GDP. The Balance of Payments: How Will Food Imports and Interest Payments on Cuba’s Debt Be Financed? 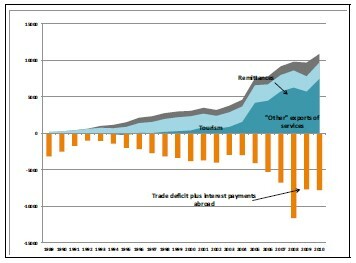 Since 2004, the Cuban balance of payments has shown a rising trend in two important items: (i) the merchandise trade deficit; and (ii) interest payments on Cuba’s external debt.15 The trade deficit reflects large and growing fuel and food imports (about onehalf of total imports in recent years) as well as the depressed level of exports. The twenty-year period illustrated in Figure 4 can be broken down into three sub-periods. From 1989 to 1993 the trade deficit narrowed as the disappearance of Soviet assistance forced a sharp contraction of imports. From 1994 to 2003 the combined negative items rose and then stabilized at a high level, as the trade balance deteriorated. However, this was compensated by a strong rise in tourism. Later, the de-criminalization of the U.S. dollar in 1993–94 encouraged a rapid increase in remittances received by Cuban residents from their relatives abroad. After 2004, interest payments and net imports surged while foreign remittances declined following the restrictions imposed in 2005, and tourism ran out of steam around the turn of the century. However, these changes were offset by a large increase in receipts from the state-sponsored activities of Cuban personnel stationed mostly in Venezuela. Considering Cuba’s inability to sustain a massive increase in borrowing from world markets, this “Venezuelan miracle” avoided the need to slash imports or interest payments, both of which would have been problematic in Cuba’s circumstances. What Should Be the Policy Response? Following the end of Soviet assistance in 1989–1990, the Cuban government reacted to the disappearance of foreign subsidies and loans by providing massive subsidies to state enterprises from its own budget. The resulting fiscal deficits were financed by monetary expansion and, with most prices rigidly controlled, this led to a huge monetary overhang and to forced saving on households. It was all a big mistake, and a steep contraction of investment and production could not be avoided. After this short and disastrous attempt to deal with the crisis by brute force, in 1993–94 the Cuban government launched a farreaching stabilization plan involving a sharp acrossthe- board reduction in government expenditure (including in particular a massive cut in subsidies to loss-making state enterprises) and structural measures that fostered economic recovery from the supply side. The economic history of that period provides invaluable lessons that should not be forgotten. intensification of the ongoing efforts to reform the banking system and expand the availability of credit to the non-state sector, particularly in agriculture. These actions should be coupled with restrained monetary and fiscal policies aimed at avoiding an explosion of the budget deficit and the hyperinflation that would otherwise result in the hopefully growing, non-regulated sector, particularly during the period following the devaluation of the peso. Finally, a gradual restructuring of the budget should be started. It would involve a shift in expenditure from budgetary subsidies and from the education and health sectors (which could happen automatically with the ending of Venezuelan programs), to infrastructure, social security (a sector in financial difficulty) and social assistance, including the creation of a system of unemployment insurance. Income and production increased rapidly in Cuba during the first decade of the XXI century. Growth was fueled by a surge in government spending and a boom in services exports and investment—all of them made possible by rapidly increasing in payments received from Venezuela. 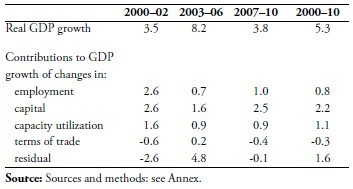 The expansion of domestic and foreign demand during the decade did not visibly result in higher inflation or in a massive deterioration of the country’s external position, partly because some of the recorded growth reflected statistical fabrication and partly because potential output also increased rapidly owing to the strong performance of investment. (In this connection, it is a good thing that part of the Venezuelan money was used to finance capital formation rather than consumption.) However, capacity utilization also increased markedly, and the gap between actual and potential GDP must have dwindled considerably, leaving little room for supply to respond to additional demand pressures. 1. I would like to thank Pavel Vidal, Lorenzo Pérez, Rolando Castañeda and Luis Luis for their valuable comments on previous drafts of this paper. 2. This paper uses mostly data published by Cuba’s National Statistical Office (Oficina Nacional de Estadísticas, or ONE). 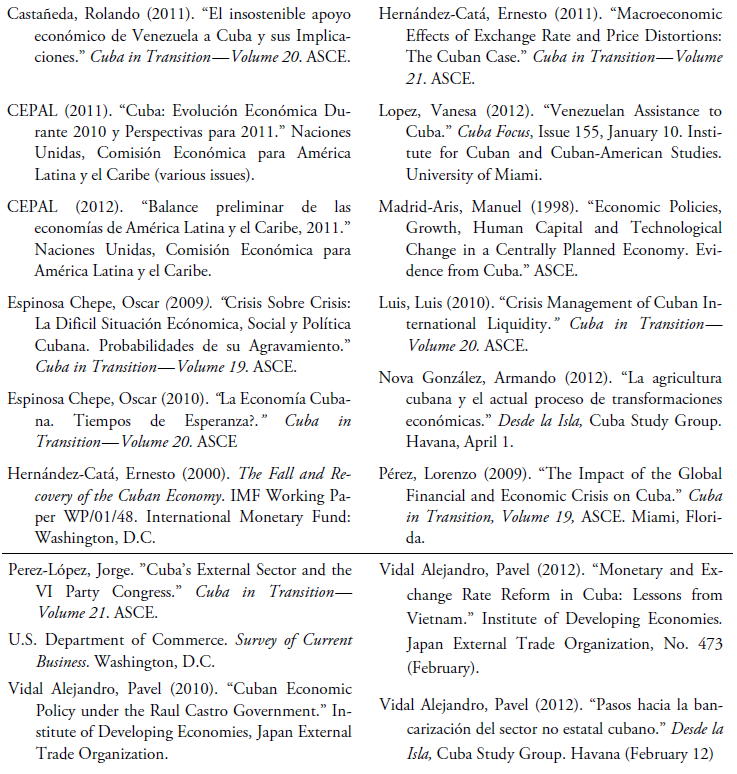 In its annual publication, the Anuario Estadístio de Cuba, ONE publishes a large number of statistical series on all aspects of the Cuban economy. However, certain sectors are insufficiently covered, such as the balance sheets of the Central Bank and the banking system, and some information has not been published for several years, notably on the balance of payments. Most importantly, the methodology used in deriving some of the statistics reported by ONE does not conform to international standards. This is particularly the case for the data on GDP originating in the social services sectors of the economy. 3. Numbers for international groupings are from the International Monetary Fund’s World Economic Outlook. 4. References to the “first decade” of the XXI century relate to the 11–year period 2000–2010. 5. Population increased by 1/2 of one percent (annual rate) in 2000–2010, remained virtually unchanged during the second half of the decade, and actually fell in 2010. The population of working age rose by even less (1/3 of 1 percent); it also fell in 2010, as did employment and the labor force. 8. M2 is currency plus time and saving deposits denominated in non-convertible pesos. 9. This is an area where secrecy complicates analysis. A price index constructed as a weighted average of prices in national currency and in CUCs would help the analysis of monetary policy, as would information on the share of prices subject to state control. 10. The numbers for non-government investment (corresponding mostly to state enterprises) were obtained by subtracting government investment (budget basis) from total investment (national accounts basis). They must be interpreted with caution because of methodological differences between the two series. 11. For a very clear analysis of the problems involved see Vidal (2009 and 2012). 12. In the case of health practitioners and educators, permission to operate privately could help to avoid unemployment if and when those now working abroad were to return home. 13. Lopez (2012) estimates these subsidies at roughly $4 billion a year 2007–10. 14. Because they are derived from budget or balance of payments statements, the estimates in Table 5 do not include “below the line” items such as loans or investments by BANDEC. In principle, these numbers should be recorded in the capital account of the balance of payments. 15. For a comprehensive analysis of external developments, see Pérez-López (2011), and Pérez (2009). 16. The Cuban authorities may be able to delay the adjustment by dipping on their foreign exchange reserve if there are any left after several years of large-scale intervention to defend the peso. Cuba has not published capital account data for several years now. However, Luis Luis (2010) has estimated, using Bank for International Settlements (BIS) data, that Cuba accumulated assets in BIS-area banks to the tune of US$4 billion during the period 2005–2009. The part of that increase corresponding to the Central Bank of Cuba is unknown. 17. At the Conference on Russia’s Economic Reform held in Stockholm in June 1994. In response to an injunction by Jeffrey Sachs to suppress hyperinflation by fixing the value of the Ruble and borrowing massive amounts from abroad.